U.S. Strategic Command forces are prepared to deter strategic attack and employ forces, as directed, to guarantee the security of the nation and its allies, the Stratcom commander told the Senate Armed Services Committee here today. Stratcom personnel are positioned across the world, and are responsible for multiple domains, including air, land, sea and space. The command sets conditions across the globe as the ultimate guarantor of national and allied security, Hyten said. Stratcom’s responsibilities include strategic deterrence, nuclear operations, space operations, joint electromagnetic spectrum operations, global strike missile defense analysis and targeting and current cyberspace operations. The general said the country is challenged by adversaries who continue to expand their range of capabilities across all of these domains, and that Stratcom must continue to develop capabilities to defeat those adversaries. 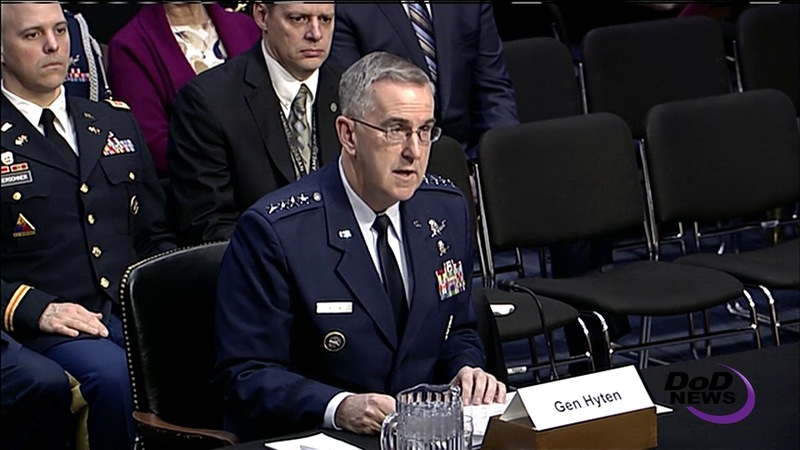 The recently completed 2018 Nuclear Posture Review reinforces and clearly defines long-standing national objectives regarding nuclear weapons, while focusing on current and future threats, Hyten said. Providing nuclear deterrence is the lead priority for Stratcom, the general added. Hyten said the nuclear triad is critical to current and future success. This includes modernization programs, such as the B-21 bomber, the Columbia-class ballistic missile submarine, the ground-based strategic deterrent, the long-range standoff cruise missile, nuclear command and control, and life-extended nuclear warheads. He said these capabilities will undoubtedly meet the nuclear deterrent needs now and well into the future.